A new health star rating system for food has got the backing of the government. Minister for Food Safety Nikki Kaye announced on Friday that the government will adopt the health star rating system, which has been developed in Australia and endorsed by ministers there in June last year. The star ratings range from ½ a star to 5 stars and are designed to give consumers “at-a-glance” information about the nutritional value of packaged food. The more stars the better. 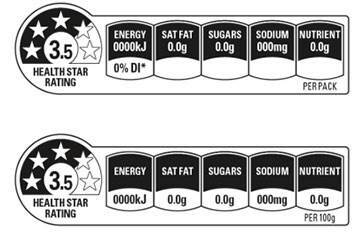 Saturated fat, sugar, sodium, and energy content will also be displayed with the star rating on the front of the pack. However, the rating scheme is voluntary and companies can choose whether or not to use the stars on their products. Along with the Australian consumer organisation Choice, we’re calling on food manufacturers to start rolling out the ratings to make it easier for consumers to make better food choices. Research has shown existing nutrition information panels, which usually appear in small print on the back of the pack, aren’t easily understood. By providing nutrition information up front, the health star rating system should help consumers make better informed decisions about what they eat. The system should also provide an incentive for the food manufacturing industry to reduce the fat, sugar and sodium content in packaged foods. One Australian manufacturer is already putting the star rating on its mueslis. If manufacturers don’t take up the health star rating system, we believe the government should introduce mandatory requirements for front-of-pack labelling.